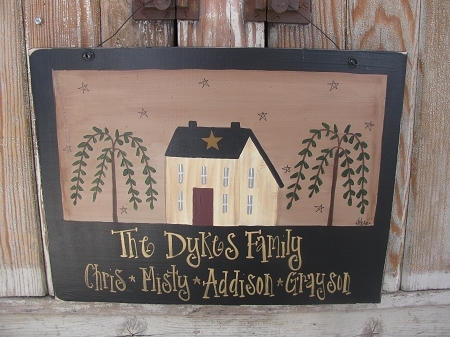 Primitive Saltbox House with Willow Trees Family Hand Painted Personalized Wooden Sign. As featured in the Country Sampler Magazine. 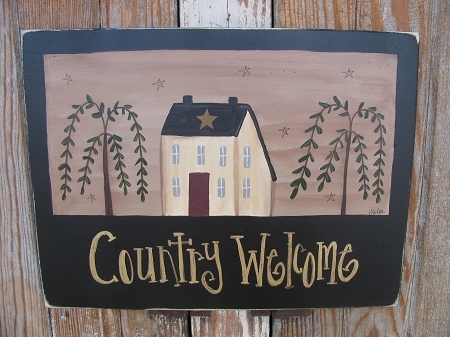 I hand painted this design featured an antique white saltbox house in the middle of two primitive willow trees. A star on the roof of the house as well as little stars in the background. The painted frame color is black, while the center is a khaki tan color with antiqued areas. It's larger in size to accommodate more names or larger personalization. You can include as much or as little as the example shown. Even a general greeting would be fine as well. Please include in area provided. The size is 15"x12". Made from a solid pine board. Choice of hanging options. Hand painted, designed and signed by Heidi.